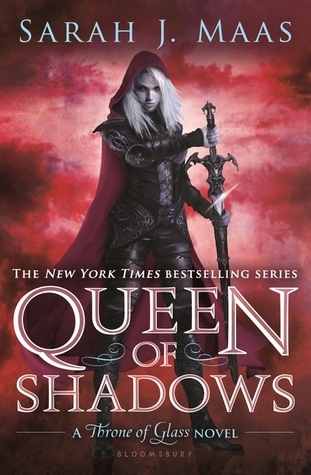 Okay, first things first, there will be spoilers for the previous books in this review, it’s kind of unavoidable but I will stay spoiler free for Queen Of Shadows. I adored this book. Beginning to end I adored this book and devoured it. It is a long book, but I still wanted more and I had a very hard time putting the book down. I just kept turning pages and reading chapter after chapter because I had to know what was going to happen. This is easily my favorite high fantasy series ever and actually just one of my favorite series ever. I love everything about it. I have to start with Aelin, and yes she is Aelin now. Gone is Celaena and in her place is a Queen who is ready to take back her kingdom. She is such a fantastic heroine and I adore her. She is so strong and fierce. She doesn’t need anyone to save her because she will save herself and then save you while she is at it. And she is smart, so damn smart. I love that she is both kickass and smart, but at the same time she loves pretty dresses and chocolate. And now is time for an unpopular opinion, but whatever. I’m honestly over Chaol and have been for a while. It started in Heir Of Fire and continued through Queen Of Shadows. I don’t know. He is a fantastic character and I love him, but I don’t love him the same way I did through Throne Of Glass and Crown Of Midnight. And the more I think about it and look back on past events; I just realize he has always had trouble accepting Aelin as she is. Like I said, I still adore him; it’s just not the same anymore. Regardless of how Aelin may feel. Rowan on the other hand I somehow came to love more. During Heir Of Fire, I fell hard for Rowan and declared him my new favorite character of the series and that holds true after Queen Of Shadows. He is a fantastic character all around and I really realized how much I loved him when he wasn’t around and I missed him something fierce. His bond with Aelin is something special and I love that they understand the darkness in one another. Aelin needed someone to look at her and see past everything she has done and just accept her and that is Rowan. Their friendship is a very very special one. Okay so many other characters I want to talk about, so let’s do a quick recap. Dorian broke my heart. I adore him still. Aedion is one I truly came to love and admire. Lysandra is amazing. Simply amazing. Then Manon is another interesting one and I can’t wait to see how her story plays out even though I’m still not quite sure what to make of her. There are other characters that I could go on and on about, but I think that covers the important ones. As this series has gone on, the world has continued to grow and the plot has expanded and I love how it’s expanded. I’ve come to realize that I’m no longer reading the books for ships or romance (which if anyone knows me knows is something I love) but I’ve just gotten so invested in Aelin that I go with whatever she wants. I love that this is her story and the story of a Queen reclaiming her thrown and saving it from dark magic. As much fun as I have getting behind a guy and rooting for him, I’ve found that I’m totally Team Aelin when it comes to this series and I support whatever and whoever she chooses. I totally understand why some people are upset over the romance (I really do because I felt a piece of my heart break while reading) but for me the way the story is going simply works. And I realize I’ve been rambling and I could probably keep rambling, but I’ll wrap it up. As you can tell, I adored Queen Of Shadows and it’s one of my favorite reads this year. I think it just knocked A Court Of Thorns And Roses from the top spot actually. It was just fantastic and I love it and I cannot recommend this series enough. I'm really glad you loved this one Teresa and that it met your expectations. :) That's so cool Lysandra made an appearance! And I was surprised to hear how her storyline went, considering I hated that girl in the novellas. Haha. I personally won't be reading this one, but I am so glad you loved it! Okay, since there were spoilers for the other books (I've only read the first one *hides*) I just skimmed your review. However, I can so happy to read that you adored this one and that the world is just so good. I'm so mad at myself for getting behind with this one. I will catch up! I only read parts too since I haven't started this series. I know. Total fail. I just added this one to my shelf. So looking forward to reading it. In all honesty, I liked Choal, esp in CoM, but I never fell for him. Rowan, on the other hand, I loved from the very beginning and loved even more in this book. He made the book for me. Well, Aelin did, too, of course. Their relationship was the best and I totally ship them.